Doing regular maintenance on your vehicle is the best way to ensure it will stay running for years and years. Of course, things will still wear out and break over the years, but if you stay on top of routine maintenance, you’ll have less surprises down the road. Changing the oil in a Sprinter van is a simple routine maintenance item that you can perform yourself. We have been working on our own vehicles for about 15 years, basically since we started driving! At first, this was out of necessity as well as education. But over the years, as we have gotten older, bought newer vehicles, and been able to afford to take our cars in to have maintenance done, we’ve still performed many of the routine maintenance items ourselves. Why do we do maintenance ourselves? That’s because it gives us a chance to look over the vehicle and potentially identify any issues before they really present themselves. It’s a good time to give the whole vehicle a once-over look and familiarize ourselves with the ins and outs of the engine. Maintenance on our Sprinter is no different. Since it is an older vehicle (a 2007 model), it has had its fair share of wear and tear over the years. And because we haven’t owned it since day one, we don’t know the kind of maintenance and upkeep that was done on it in its early life. Over the past week, we have done a series of maintenance items on our Sprinter van in preparation for our next stint of travels. Somehow, our travels tend to take us about 10,000 miles before we end up back in Oklahoma, so it works out perfectly with service intervals. We don’t plan it that way, but somehow that is how it has worked out! Here are the service maintenance items that we performed this week, although we are just talking about the oil change today. In addition to all of this, we also changed our shocks, which can be found here. This should be done about every 50,000 miles or whenever the shocks start feeling worn. Changing them made a massive difference in the ride of our Sprinter van! 14 Quarts of Oil (IMPORTANT: The oil needs to meet MB Approval Spec 229.51. Pennzoil Platinum Euro L 5W-30 meets this spec, as well as the Mobil 1 ESP 0W-30 shown in the video) This engine takes 12.5 quarts, but because this oil is not readily available in auto parts stores, we recommend keeping one extra on hand for top offs in between changes. You can see the specific parts for all of the above in our kit HERE. An oil change on a Sprinter can be done while the engine is hot or cold, but we prefer to do it cold to avoid burning ourselves on the hot engine. With some rags on hand for spills and the drain pan under the oil pan, remove the oil drain plug and allow the oil to drain completely. Check the drain plug gasket at this point for any signs of wear. If it is worn out, you can get a replacement from your local auto parts store for about $2. While the oil is draining, we’ll go ahead and remove the oil filter. This will release some pressure and help the rest of the oil drain, and we need to replace the filter anyway. Although it’s not completely necessary, removing the air filter housing will free up some work space to remove the oil filter. This is very easy to remove, so we like to go ahead and remove it to make working on the oil filter easier. See the video above for removal of the air filter housing. Using the oil filter wrench and a ratchet, remove the oil filter/oil filter housing. Have a rag on hand to catch any oil spills as well. Once the oil filter is out of the engine, separate the oil filter from the oil filter housing and put the housing to the side. The new oil filter comes with two new O-Rings, which need to be replaced on the oil filter housing. Once those are replaced, put the new filter into the housing and screw the whole assembly back into the engine. 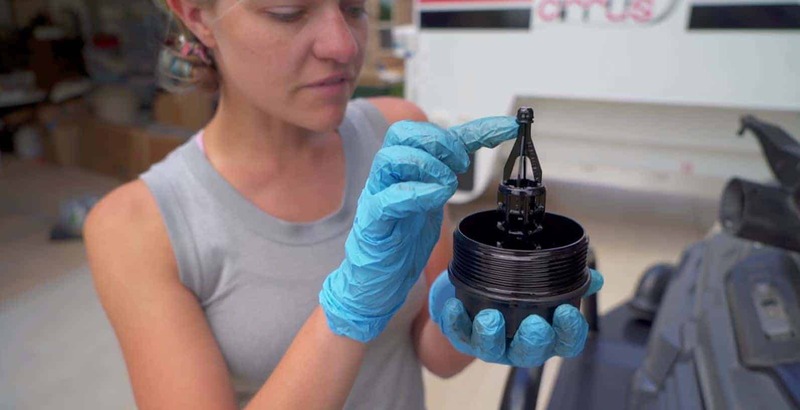 The new oil filter only needs to be hand tightened, not wrenched down. Re-install the oil drain plug. Reassemble the air filter housing. Put the new oil in using the funnel, careful not to overfill or spill any oil. Since this engine takes 12.5 Quarts of oil, you’ll have one quart that will only be half used. We will keep that bottle and the extra quart on hand for any top-offs needed. 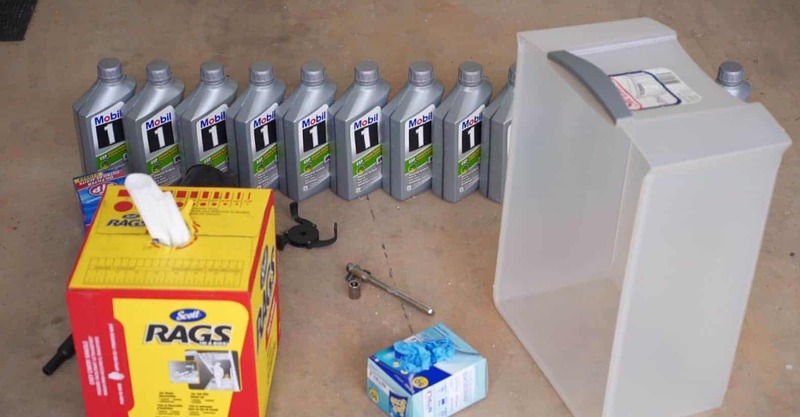 Now that the oil is changed, start up the engine and check for any leaks. Let the engine run for a few minutes while you check for leaks, then turn off the engine and allow the oil to settle into the drain pan and check one more time. Once you have changed the oil and performed all of the Service A Checklist items, be sure to reset the service counter light as well. That information can be found here. That’s all there is to changing oil on a Mercedes Sprinter van. Be sure to let us know in the comments if you have any questions about this process.